This is a bright and colorful easy game for children who are in preschool or even younger. 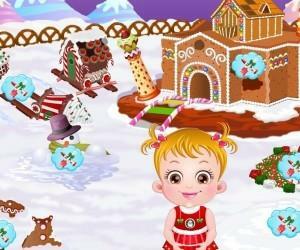 The game follows a baby named Hazel and her two friends through her first day of preschool. There are four levels which are very simple and easy. The game is simple enough to play, just click and drag as Hazel tells you what to do. In order to complete each level you must raise Hazel’s happiness level to 100 within the time limit. The quicker one completes the level the more bonus points one receives. Hint bubbles appear on each level to help out if you do not know what to do next. Even though the game is fairly easy it is possible to lose by making the babies cry. The first level takes place in Hazel’s room as she is waking up. She is in a playful mood and you must convince her to get ready to go to school. A few of the tasks are helping her take a shower, getting her dressed, and feeding her breakfast. Once you finish the tasks Hazel wants you to do she is ready to go to school. In the second level Hazel reaches school where her two little friends are also there. The level starts out with the three babies being able to play for a little while. Then they must gather around a table. The teacher begins to talk to Hazel and asks her to separate fruits and vegetables into two different baskets. The teacher asks Hazel to color in a flower with different colors. Lunch time is the third level. During this level the teacher has Hazel make her lunch in a creative way; first by making a pancake sun with fruits and then by making a star sandwich. In the fourth a last level it is play time. Simple enough this is just keeping the children entertained with the different toys they want to play with. After you get Hazels happiness level raised to 100 you have won the game! Today is Baby Hazel’s first day at the preschool. Baby Hazel is in a playful mood and not interested to go. Convince Baby Hazel and get her ready to go to the preschool. When she is in the preschool with other kids, help them perform different activities by fulfilling their needs. Check hint bubbles to know the needs of Baby Hazel and others. Fulfil their needs quickly to earn bonus points. You lose the game if you make the kids cry. Use mouse to interact with Baby Hazel and friends. Enjoy!